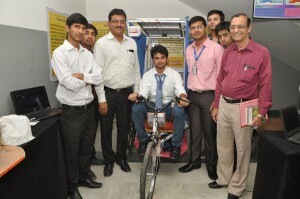 120 innovative projects displayed at ‘Project Carnival’ by students of Manav Rachna Educational Institutions. 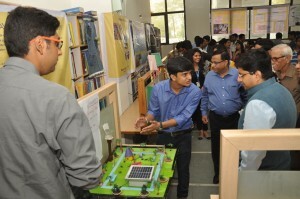 More than 1200 students from schools across Haryana visited the Manav Rachna International University campus today to witness the first-of-its kind “Project Carnival”― a unique project exhibition and competition showcasing 120 innovative projects developed by students of Manav Rachna Educational Institutions (MREI). The “Project Carnival”, a tribute to Founder Visionary Dr. O P Bhalla was inaugurated by Ms. Satya Bhalla, Chief Patron, MREI along with Dr. Prashant Bhalla, President, MREI; Dr. Amit Bhalla, VP, MREI; Dr. N C Wadhwa, Vice Chancellor, MRIU and other senior dignitaries. A champion of ‘out-of-the-box ideas, Dr. O P Bhalla always encouraged students to bring their revolutionary ideas to the shop floor. It led to the creation of amazing projects which were all about risk-taking and a perfect blend of innovative ideas and utility. 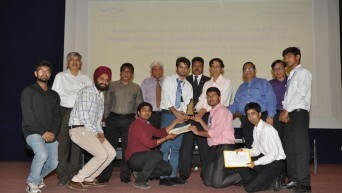 To celebrate Founder Visionary’s penchant for research and innovation, a plethora of projects such as Infinity Mirror, Respiron, e-rickshaw, Electronic Stethoscope, Cube in a Cube with Pen Stand, Musical Pencil, Wireless Voltage Detector, Electronic Wheelchair, among other projects were displayed at the Carnival. The projects centered round categories such as Mechanical Engineering, Electrical & Electronics, Computer Science and Engineering, Bio-Tech and Life Sciences, Environmental Science, Art & Culture and Science, Healthcare, Civil and Architecture. Students of Manav Rachna International Schools also took part in two categories, senior and junior with each category comprising projects on Science and Art & Culture. All the entries at the Competition were evaluated on the basis of several criteria, namely, the significance of problem being addressed, the impact on potential users, originality of the design and the efficacy of the working prototype. 1st and 2nd prizes were awarded to the best projects across the 8 categories. Dr. Prashant Bhalla said: “Manav Rachna Educational Institutions’ mission is to support multi-disciplinary research and development in the fields of engineering, biotechnology and physical sciences. Such competitions provide great opportunities for young minds to find innovative solutions to problems and challenges in their respective fields”.